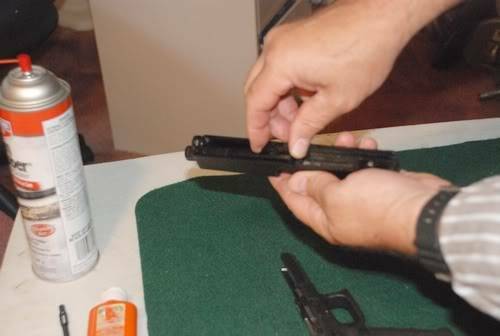 Cleaning a GLOCK pistol is quite easy considering their simplicity, minimal parts, and Tenifer metal treatment. This all makes them durable enough to use aggressive and fast cleaning methods. 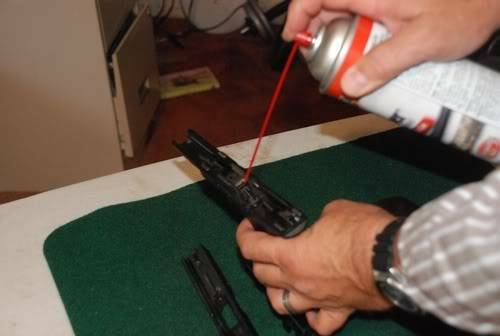 I don't know of anybody who cleans a GLOCK after every use. Don't get all bent out of shape. I just don't personally know any and I'm not endorsing not cleaning it. They just work well for quite some time even if not cleaned. But when it's time to clean one, it shouldn't take up a major part of your life. Before we get started, here's a list of what I use to clean most all guns. 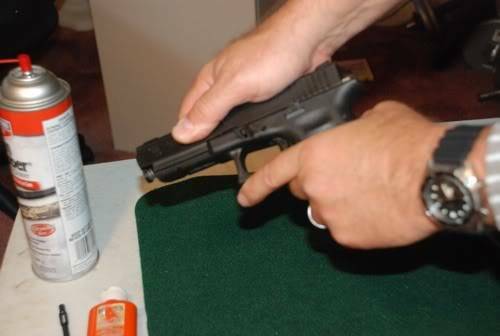 And while this article is on cleaning a GLOCK pistol, the techniques here are basic and apply to most all of my semi auto handguns. First are the cleaners and scrubbers, CRC Brakekleen and Remington Gun Scrubber. 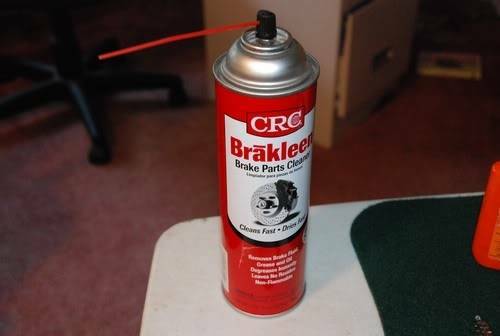 Either of these sprayed directly on oily residue will remove it, with the brake cleaner being the most effective and drying of the two. Neither is particularly hard on the finish of most modern guns. Next are the Hoppes solvents and oil. 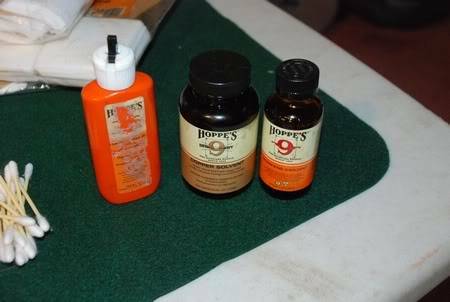 There are a lot of gun solvents on the market and some people seem obsessed with finding the newest, latest, greatest......just get everything you need from Hoppes. It all works well and has for generations. Then to use the solvents on, the assortment of brushes, patches, etc. These are for breaking loose and physically scrubbing and cleaning out powder residue, lead, copper and other grime from the barrel, slide and frame. 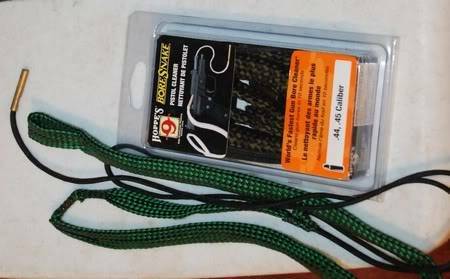 Finally, a product that deserves it's own article is the Hoppes Bore Snake. This innovative and useful item is a cloth snake that has embedded in it a brass brush. You simply dip the brush in Hoppes #9, drop the metal end of the Bore Snake through the chamber end of the barrel and pull it all the way through. It scrubs, loosens grime and cleans, all with one pull. A few pulls of the Bore Snake through most barrels is all it takes to clean it. This makes it a great item to have in the field for quick barrel cleaning. 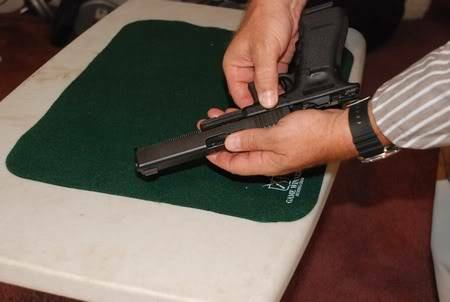 When it's time for cleaning a GLOCK pistol, a lot of delicacy is not necessary. 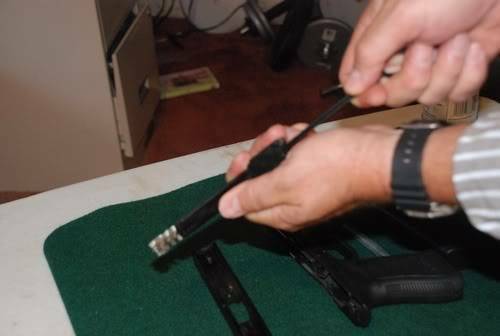 Start by taking the gun apart, magazine, slide, barrel, guide rod and frame. Here are the parts laid out when apart. 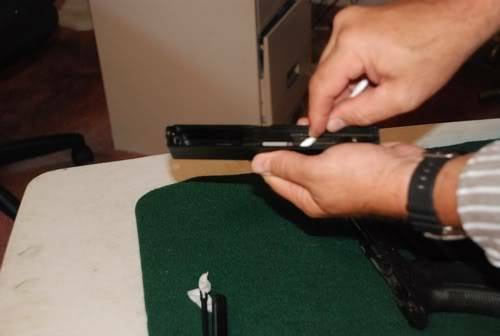 To disassemble, first remove the magazine and check the chamber to be sure the gun is not loaded. The take down lever is right at the tip of my thumb in the picture below. 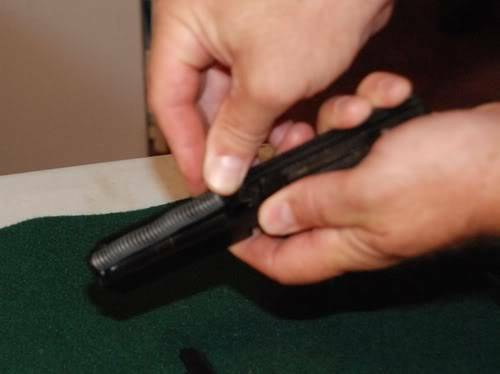 With one hand, pull the slide back about a quarter inch while with the other hand pulling down on the small release lever above the trigger guard. Release the slide forward with the lever pulled down. The slide will come free and slide off. 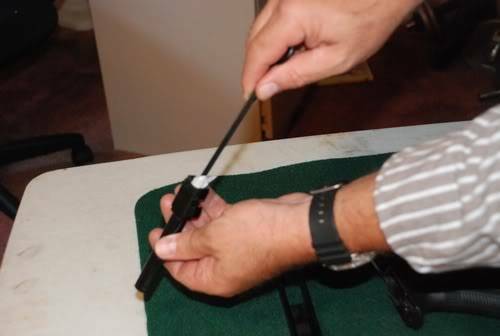 Remove the guide rod by simply pushing in and lifting it out. Finally lift the barrel from the slide to complete the disassembly. 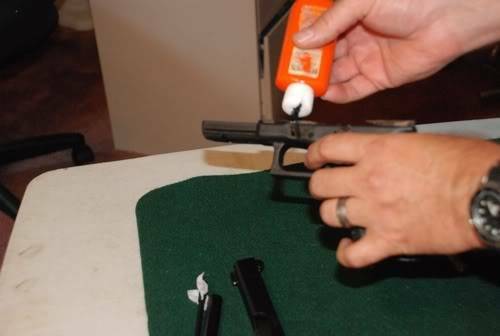 When the GLOCK pistol is disassembled, it's time to do some basic rinsing out with something like Remington Gun Scrubber or carburetor cleaner. You'll find all kinds of hand wringing online about carb cleaner, but this will work just fine and won't hurt your gun. Spray out the frame, slide and barrel. You can also spray it in, and shake it around in the magazine. Lean all parts in a manner where they will drain and go do something else for a while. After letting the parts dry comes the deep, detail cleaning, including the barrel. To clean the barrel, you can use a brass brush in the proper caliber or a Bore Snake, which is a great time saver and excellent cleaner. In the case of the brush, you will need to dip it in some kind of solvent like Hoppe's #9 and run in and out, from chamber to bore, through the barrel eight or ten times. After this a solvent soaked patch should be run through the barrel, followed by multiple clean patches until clean. The other option is to soak a Bore Snake brush in solvent and run the Snake through the barrel, chamber to bore several times. Check the barrel with a bore light, small flashlight, or by holding it up to a light bulb and looking through it. Examine it from both ends. 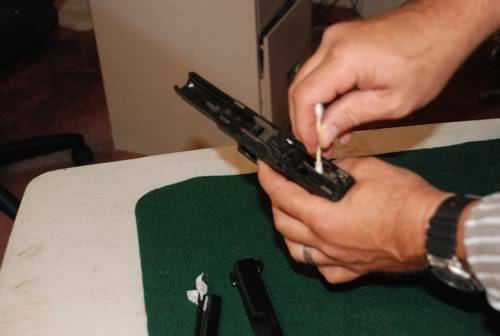 For a GLOCK barrel, the above procedures should get it sufficiently clean the first time. If not, repeat until clean. Next, take some Q-Tips or other cotton swabs dipped in solvent and clean out the various nooks and crannies in the frame, that can be accessed by the swab. It will take multiple swabs to get this done and you can expect to get some pretty nasty looking black residue out with the swab. Be sure to swab the rails, and when done wipe it down as well as possible with a clean rag. Next, swabbing the rail grooves on the slide and cleaning the recessed areas, wiping all out with a clean rag will complete the cleaning. Generally, that's all it takes. 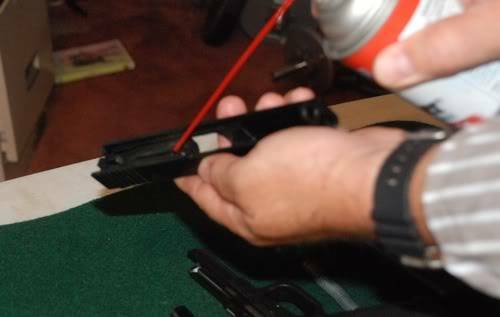 If a gun goes for a very long time and lots of shooting without being cleaned, the methods above will have to be more intensive and thorough, but for the average cleaning, that's it. Before reassembly, lightly oil the rails and basically anything that you can move with just a drop of oil. Wipe any excess oil off. 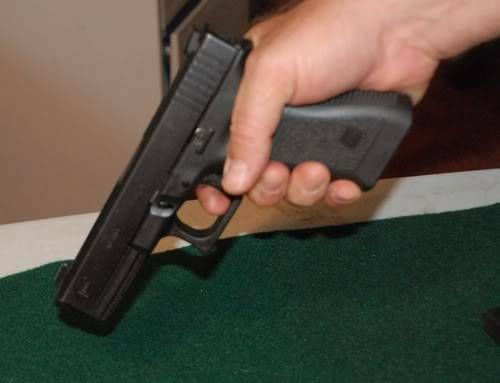 To put the GLOCK pistol back together, drop the barrel in the slide. Insert the rounded end of the guide rod in the ring in the front of the slide. Compress the spring slightly and put the other end against the spring stop on the barrel. Next line up the frame rails and grooves in the slide. 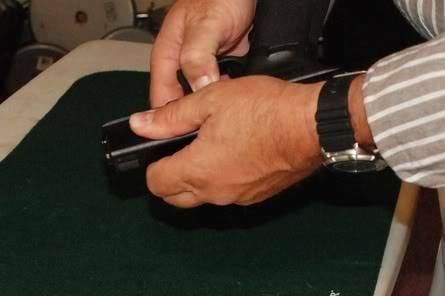 Push the slide forcefully back until the trigger sets. Release the slide and pull the trigger. 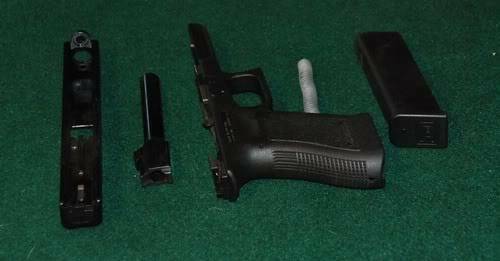 Insert the magazine and the GLOCK pistol is once again ready to go.